The search for debris from missing Malaysia Airlines flight 370 has not turned up any evidence of a crash, but it has trained the world’s gaze on thousands of pieces of junk floating on the ocean’s surface. Much of that debris could be made up of plastics, old appliances or parts of homes that have washed away from fragile communities, and cargo containers from ships, according to ocean advocacy group One World One Ocean. The Pacific Garbage Patches: The most heavily-researched and well-known example of plastic pollution in the ocean is the Great Pacific Garbage Patch, made up of some 3.5 million tons of plastic beverage bottles, grocery bags, and plastic goods that have been pushed together by water currents that circulate between the west coast of North America and the east coast of China and Russia. The Five Ocean Gyres: Pollutions can easily get caught in one of the five “gyres” of the ocean: the northern and southern Atlantic gyres, the Indian Ocean gyre, and the northern and southern Pacific gyres. The term describes water that moves in a circular, rotational current over a vast space in the ocean, pulling in stray plastics as it moves until they collide and merge with one another. Because these gyres are trafficked heavily by cargo ships, the garbage patches contain large objects that have gone overboard from ships, including entire cargo containers. Indian Ocean’s Plastic Problem: Researchers only began focusing on plastic pollution in the Indian Ocean in recent years, and in 2010 discovered garbage patches much like the famous Pacific Garbage Patch, according to Coastal Cares, another clean ocean advocacy group. Plastic Breaks Down: As the garbage floats into the gyres it is broken down by salt and UV rays and begins releasing chemical properties into the water that then enter the food system, according to the Scripps Institute at the University of California San Diego. The plastics also fall into smaller pieces that can make them difficult to clean up. Houses swept away by floodwaters; record drought, wildfire and hurricanes; melting ice caps and the hottest summer on record – how can anyone doubt global warming? Photographer James Balog, once a skeptic, sets out to prove it through his Extreme Ice Survey, capturing photographic evidence of melting, disappearing glaciers. Filmmaker Jeff Orlowski documents the lengths to which Balog goes to prove his point – including kicking off his boots to plunge into the icy water for one chilling shot in Chasing Ice. Despite a bum knee, Balog hikes ice caps in Alaska, Iceland and Greenland, placing specially developed cameras that will endure the harsh conditions and record the glacier meltdown through time-lapse photography. The Sundance Film Festival award-winner will be screened at the seventh annual Princeton Environmental Film Festival Feb. 2, 7 p.m. It is one of 35 films that will be shown over three weekends, Jan. 24 through Feb. 10, at the Princeton Public Library. Chasing Ice “is the best visual representation of climate change I’ve ever seen,” said festival director Susan Conlon. It took seven years for Balog to create and station his cameras and have them execute the images, yet his time-lapse videos compress those years into seconds to show ancient mountains of ice disappear before our eyes. Observing Balog up close, “I have never met someone so dedicated to their passions,” filmmaker Orlowski said. The theme for this year’s Princeton Environmental Film Festival is “sense of place.” When we think of environmental issues such as climate change, reckless development and green energy affecting our own state, town, even neighborhood, they become more threatening. “Many of the films tell stories about people and places outside our state, and reveal how we are more connected than we realize,” said Conlon. Films falling into this category are “You’ve Been Trumped” (d. Anthony Baxter) in which a group of townspeople in Scotland band together when developer Donald Trump begins construction of an elaborate golf resort on a fragile piece of wilderness in Scotland; “Detropia” (d. Heidi Ewing and Rachel Grady), told through the eyes of people struggling to stay in post-industrial Motor City, once a grand city; “The Battle for Brooklyn” (d. Michael Galinsky and Suki Hawley) about the struggle of residents fighting to preserve their neighborhood from the developer of Atlantic Yards, including Barclays Center sports arena. Princeton resident Andrea Odezynska made Felt, Feelings and Dreams, following a small group of Kyrgyz women who pull themselves out from crushing poverty by reviving ancient traditions of making crafts and art from felt. Against scenes of rocky mountains dotted with yurts and traditional ethnic music from the region, we see women of all ages pouring their might into shearing, soaking and beating the wool fibers, rendering it into colorful textiles. In the six years since the festival was begun, “we have learned a lot about what makes it appealing to people returning from previous years and those just discovering it,” said Conlon. The Princeton Environmental Film Festival takes place Jan. 24-27, Jan. 31-Feb. 3 and Feb. 7-10 at the Princeton Public Library, 65 Witherspoon St., Princeton. The complete schedule can be found at the festival’s website. Free admission to all films, thanks to support from Church Dwight, Inc., Terra Momo Restaurant Group, and The Whole Earth Center of Princeton. Doors open 30 minutes prior to screening; reservations not accepted. And that may be part of it. But there’s a new idea: The cause isn’t in the water; it’s above it — a kind of air pollution called aerosols. This NASA map shows the size of aerosol particles in the atmosphere. Green areas indicate larger, more naturally occurring particles like dust. 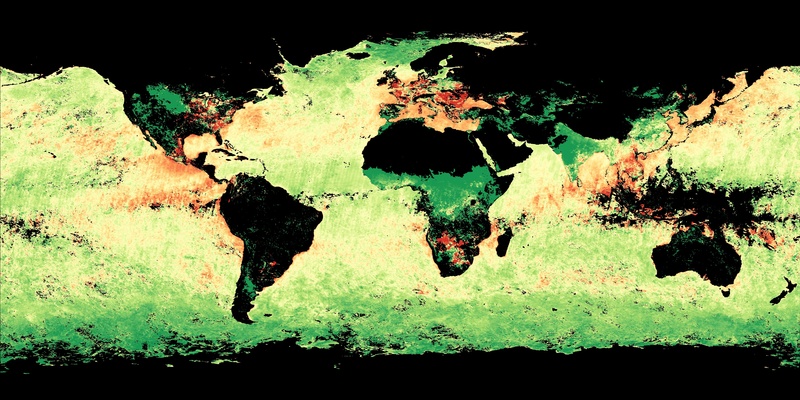 Red areas indicate smaller aerosol particles, which can come from fossil fuels and fires. Yellow areas indicate a mix of large and small particles. Ben Booth, a climate scientist at Britain’s Met Office Hadley Center, says that aerosols create clouds. Aerosols are fine particles like soot or sulfur compounds, mostly from burning fuel. They seed a kind of cloud that’s especially good at reflecting solar radiation back into space. Even on their own, without clouds, these aerosols act like sunblock. “If you combine the role of volcanic activity and the human emissions of aerosols, we account for 76 percent of the total variation in sea surface temperature in our study,” Booth says. That’s a huge amount. Booth and his colleagues aren’t the first to propose that aerosols influence sea surface temperatures. But climate scientist Amato Evan at the University of Virginia says they’ve done the most thorough job to date of tracking and confirming those changes. “If they’re right, human activity has a huge influence on just so many climate processes around the Atlantic Ocean,” he says. Surface temperatures around the Atlantic influence the amount and timing of rainfall in West Africa and the Amazon in South America, and whether there’s drought there. They affect the number and strength of Atlantic hurricanes and even where hurricanes go. That’s if, as Evan says, Booth and his team are right. Booth used computer models to analyze a very complicated process — the interaction of ocean and atmosphere over many decades. The models’ predictions didn’t match all the changes people have actually observed in the Atlantic. Evan says scientists need more hard evidence to nail down exactly how aerosols affect oceans, but he’s observed a similar process going on in the Indian Ocean. “The same type of release of pollution aerosols coming from the Indian subcontinent is actually changing the monsoon,” he says, referring to the pattern of rainy and dry weather in the Indian Ocean. The new research appears in the journal Nature. If it’s confirmed, it could foretell a warmer Atlantic, because the aerosol pollution has apparently cooled the Atlantic some. But new pollution controls are reducing the amount of those aerosols — that’s good for public health, but it also means the ocean loses its sunblock. The combined impacts of climate change and increasing population pressures on coastal areas for living and recreation have placed beach ecosystems under severe pressure. New research suggests efforts to preserve the biodiversity of sandy beach ecosystems should be undertaken within the framework of Integrated Coastal Management(1). The aim is to integrate the physical protection of coastlines with the conservation of threatened ecosystems. As key recreational sites, sandy beaches are of prime social, cultural and economic importance and dominate the world’s coastlines. They also provide critical and irreplaceable ecosystem services and there is a growing recognition of the ecological value of beaches. However, current beach management is largely concerned with managing sand budgets and erosion, while ecological aspects are rarely considered. Co-operation between beach managers and ecologists is therefore important, according to the researchers. They produced 50 ‘key statements’ summarising how essential features of sandy beach ecosystems function and are structured, which include defining the physical features of beaches, the functioning of beaches as ecosystems and incorporating the protection of beach ecosystems with wider management practices. powerful waves, increasing beach erosion. to the oceans and this will affect the ecology of the beaches. Within decades, acidification of the oceans will negatively affect marine organisms that need calcium carbonate to form shells, such as urchins and snails. Four principles have been proposed by the researchers to integrate the ecological and physical aspects of management strategies for sandy beaches, which will help beach ecosystems withstand the pressures of climate change. It is suggested that ecologists, managers and policy makers work together at all levels of decision making in implementing effective and enduring strategies to conserve coastal ecosystems. There is also a need for further development of modelling techniques to study the impacts of climate change on beach ecology and to combine this with the effects that various management strategies will have on beach systems. A further issue highlighted by the study are the special difficulties caused by tidal conditions for scientists trying to study beach organisms. The researchers have consequently produced a code of ‘best practice’ which contains 11 recommendations to help ecologists develop the most appropriate methods when collecting samples. Source: Schlacher, T.A., Schoeman, D.S., Dugan, J. et al. (2008). Sandy beach ecosystems: key features, sampling issues, management challenges and climate change impacts. Marine Ecology. 29(Suppl. 1): 70-90.